Are you still not accepting credit cards? Does your utility accept credit cards? If your answer is “No”, then my next question to you is “Why not?”. The fees are too expensive. It’s not fair for all of our ratepayers to pay for a few customers who pay by credit card. My board doesn’t want to. The bottom line is this is 2011 and your customers expect to be able to pay by credit card. Where else do your customers do business that only accepts cash and checks? The grocery store, the gas station, even fast food restaurants now accept credit cards. Beyond providing reliable utility service to your customers, your most important objective is getting paid for that service. A portion of your customer base may not be able to come up with the cash to pay their utility bill when it’s due, but I will wager that many of these same customers have a credit card (or credit cards) with enough of a credit limit to pay their utility bill. So why not let them pay you? There is a cost associated with processing credit card transactions. But these fees can be negotiated. If your bank or current credit card processor refuses to negotiate a better fee structure with you, take your business to a merchant partner that will. A number of our customers at Logics have received very aggressive rates from Bankcard Associates. If you would like more information about Bankcard Associates, please give me a call at 919-232-2320 or e-mail me at gsanders@logicssolutions.com. This is a tough one. Some boards are more progressive than others and if your board is dead set against accepting credit cards, you may not have any options. But I would encourage you to take an informal survey and keep track of every time a customer asks if you accept credit cards. Use this information to make a presentation to your board. If you would like assistance in preparing a presentation for your board, give me a call at 919-232-2320 or e-mail me at gsanders@logicssolutions.com. If you don’t accept credit cards, I strongly encourage you to consider doing so. Your customers will thank you. Let’s talk about your cut-off for non-payment policies, specifically how much you charge and to which accounts you assess the fee. How much is your cut-off fee for non-payment? At the 2010 Logics User Meeting, I presented the results of a Delinquent Accounts Study that we conducted. 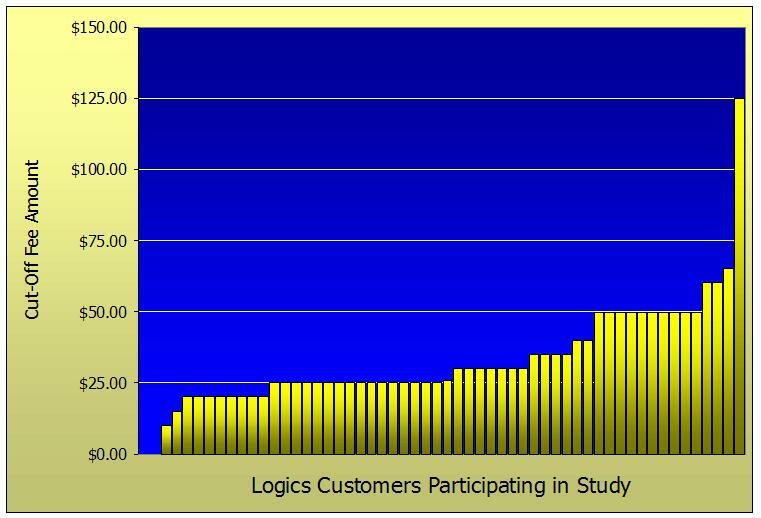 Of the 56 Logics customers that responded to the survey, 54 of them assessed a cut-off fee which ranged from $10 to $125 as shown in the graph below. As illustrated by the graph, 27 customers, or half of the study participants, charge a fee of $25.75 or less. I would argue that a fee in this range doesn’t begin to recover the cost to the utility of administering the disconnection and subsequent reconnection after the account pays. Without even taking into account indirect costs, it’s easy to see where $25 probably doesn’t begin to cover the cost of a disconnection for non-payment. If your cut-off fee isn’t high enough to recoup the cost of administering the cut-off and subsequent reconnection, I encourage you to increase your cut-off fee. If you need assistance determining what an equitable cut-off fee would be or preparing the case to convince your board, give me a call at 919-232-2320 or e-mail me at gsanders@logicssolutions.com. When do you charge the cut-off fee? Do you adhere to the best practice of charging the cut-off fee to every account on the cut-off list as soon as the list leaves your office? Or do you still follow the practice of contacting the field service technician each time an account on the cut-off list comes in to pay to see if the account has been cut off yet or not, and only charge the fee if the account has actually been cut off? I firmly believe that it is inherently unfair to charge the cut-off fee only to accounts that have actually been cut off. Why should accounts that are farther from your office, and therefore end up being cut off later than accounts closer to your office, be given additional time to pay? Let’s face it, every account on the cut-off list is seriously delinquent and has had ample opportunity to pay before cut-off day. Not to mention the added confusion in the office when the cashier has to contact the field service technician every time a customer on the cut-off list comes in to pay. In the Delinquent Accounts Study that I mentioned above, 76% (41 of the 54 customers) have a policy of charging the cut-off fee to every account on the cut-off list when it leaves the office. I was surprised that number wasn’t higher. If your policy isn’t to charge the fee to every account when the cut-off list is prepared, I strongly recommend that you consider changing your policy. Again, if you need help making the case to your board, feel free to give me a call at 919-232-2320 or e-mail me at gsanders@logicssolutions.com.